The Nike SB Stefan Janoski Hyperfeel is a men’s skateboarding shoe that delivers an incredible board feel due to the Nike Hyperfeel system: a combination of locked-in fit, sensitive cushioning and outsole flexibility that allows the shoe to act as a natural extension of your foot. 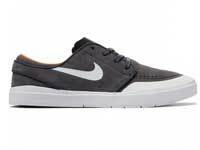 The Nike SB Stefan Janoski series of sneakers first released in 2013, with the "Nike SB Zoom Stefan Janoski" model making its debut. 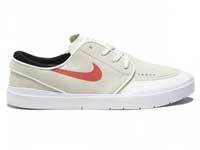 Janoski revealed in 2013 that he is completely responsible for the design of the shoe, following initial resistance from Nike, Inc. The Janoski line of skateboarding shoes are wildly-popular and successful, and now are an integral part of the Nike brand. Looks like a comfortable fit and would have good traction on a skateboard. It’s also a kind of omni looking shoe. You could wear it anywhere. Looks like Nike is going for a much simplistic look for this one. I can tell its not as classy as a Jordan but, neverthe less it does the job so kudos. Not into skateboarding but I’ve always had Janoskis ever since it came out. It’s my everyday shoes. Can’t go wrong with it man! Well hello Christmas! Stefan Janoski is lit and I’m gonna cop two! Black/Anthracite and White/Ember Glow. Great contrast. Those are some greazy shoes. What’s the cheapest pair on the market? The flat lace suits the shoe. It makes a more light feel to it. I love that it is black. But if you like white as well they are available. So true Salvador, flat laces make it lighter to use. My boyfriend collects Nike SB Stefan Janoski sneakers. I’m sure he’d be overjoyed if I give him a pair of Stefan Janoski Hyperfeel XT for Christmas. Nice shoes.. very comfy to wear and the design and is pretty simple and good. These look like fine pairs of the classic skateboarder’s shoes. I expect that the grip of the soles are up for that task. Well, this is from Nike so I believe that the quality will be up to par. The color choices look pretty good as well! As a skateboard fan, I’d say these shoes are pretty much the design I’m most comfortable with. I prefer bright colors though, but the simplistic tones to choose from here seem to make them more versatile for wearing in other occasions. I’d likely purchase a pair!